Growing up, our family lived out-of-state from the rest of the extended family of my father and mother. Most vacations were spent traveling to spend time with them. We had many fun sleep-overs waiting for the local Easter Egg Hunt, 4th of July Parade and any other excuse we could find to be together as cousins. My Aunts were very gracious to let us stay, they were all wonderful hostesses. 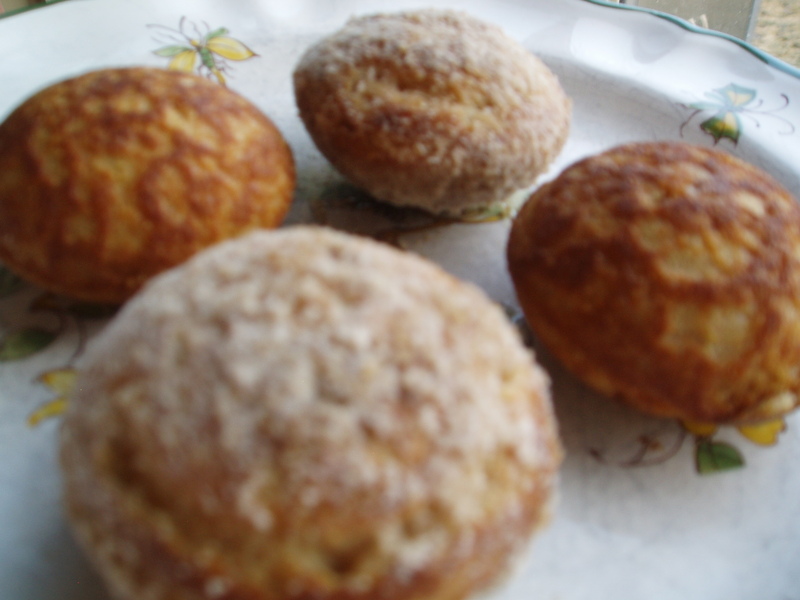 If we were lucky enough to stay at Aunt Diane’s, breakfast was extra special: ebelskivers. I remember watching her, facinated, filling the hole-filled pan with the puffy, golden pancakes, that she would roll in cinnamon and sugar before we ate their yummy goodness. Over the years they’ve remained the most charming breakfast in my memory. allow to cook for a few minutes, or until tops are nearly done…bubbling, turn and cook another minute. (use a skewer or something similar to turn them…you can also tell if they are done when skewer or metal fork comes out clean when turning). 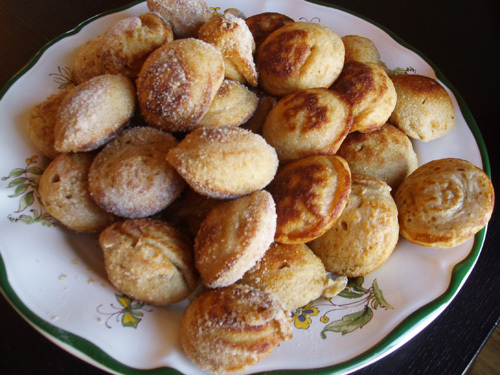 roll ebelskivers in cinnamon & sugar and serve. In a medium-large bowl, combine sourdough starter, oats, and whole wheat flour, water, and yogurt. Soak covered, for 8-12 hours. Beat eggs and add them to the dough. Fold in remaining ingredients: baking soda, salt, and melted butter. Cook like above and serve with your favorite toppings. You can also drop a small dollop of cream cheese, applesauce, preserves, etc. before turning. We’ve tried the cream cheese and really enjoyed it. The kiddos also enjoy them plain (without dusting), dipped in maple syrup. We love these!! We have two pans and make them often. The kids love it when their dad sticks little pieces of fruit in the middle. We dip them in homemade jam or powdered sugar. It is one of our favorite Sunday morning breadfasts!! Did you know that you can make dinner ones too?? There are cheese ones and chicken ones. They are all totally amazing. 🙂 thx so much Sophie, i’m loving reading about your nut milk, pulp and creative vegan recipes too! you bet! we’ve also made a sourdough version (use 1 cup sourdough starter in place of 1 cup of flour). enjoy! Are you using soft wheat (pastry) or hard wheat (bread)?